It's rare to find a child that doesn't like at least some of Disney’s animations. Recently I’ve found them a little bit hit and miss - as a child I loved every film I came across, yet lately I've found that some of them haven't quite had enough of that Disney spark. ‘Moana’ has been in the news a fair bit already (mainly down to a kids’ costume some found to be racist) but don't let that put you off as this is a classic Disney film that's well worth watching. Set on an ancient Polynesian island, Moana (Auli'i Cravalho), daughter of Chief Tui (Temuera Morrison), is fast growing up to be the next chieftain. Everyone's pretty happy except her - since a mystical occurrence during her early childhood she's been obsessed with the ocean, yet it's well known within the community that you don't sail past the reef due to the dangers that lurk beyond. Unfortunately a plague hits the island meaning that their food supply starts to dwindle, and so Moana bravely decides to take it upon herself to fix the problem by going to sea to set things right. I've got to say that I was impressed with ‘Moana’ the whole way through. Gone are the days of submissive princesses who can only succeed with the love of their prince - Moana is a strong, powerful female lead who's also got visible flaws, meaning that she's an inspiring role model for younger viewers. What made it even better was that there’s not a single love interest in sight, with Disney choosing to focus on family relationships and forgiveness instead. As well as Moana, there were some other really great characters such as Moana’s outwardly crazy but clearly wise grandmother Gramma Tala (Rachel House) - her inspiration for tackling the ocean - and Maui (Dwayne The Rock Johnson), a Demigod with moving tattoos who ends up spending more time with Moana than he bargained for. Although a minor character Jermaine Clement (you may know him as the specs-wearing band member in ‘Flight of the Conchords’) is also great as Tamatoa, a trinket-obsessed giant crab who adds a slightly different tone to the soundtrack. Humour is also a really key part of ‘Moana’ - although it's filled with traditional Disney charm there's also a lot of mocking their previous stuff, such as Maui’s line “If you wear a dress and have an animal sidekick, you're a princess.” Kids won't necessarily get this, but it adds comedic value for the adults that are getting bored of the usual animation formats. Talking of animation, I was wowed by the stylisation of the film. There's a blend of classic Disney animation and culturally-inspired 2D drawings that are somewhat reminiscent of the style found in ‘Hercules’. The visuals are very easy on the eye, and the painstaking detail of textures such as the water and the molten landscapes really brings the environment to life. 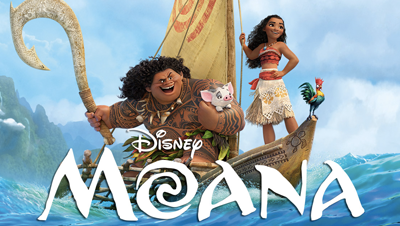 ‘Moana’ is an absolute treat for all children, and sends home a strong message. Its maybe slightly frightening at points for younger viewers, but captivating from start to finish. Check In to Win this Bank Holiday!